A French pressing of the Beatles first LP on the Odeon label, bought as a souvenir of a trip to Paris in about 1969. At the time, I probably didn’t know the chronology of Beatles albums – I just wanted a bunch of songs I knew and this seemed a great deal as I was familiar with all of them since the Beatles were a big part of the soundtrack to my childhood. In fact, probably my first musical memory ever is of singing ‘I Wanna Hold Your Hand’ in the playground of my infants school in 1964! Anyhow, this debut pressing, recorded in just one day. contains fourteen tracks, none over three minutes. Eight are by Lennon and McCartney themselves (something of an innovation to have a pop band writing its own material), the remaining six by America songwriters. Four of these are rather good: Gerry Goffin and Carole King’s ‘Chains’ (sung by George), Arthur Alexander’s ‘Anna’ and of course the closing track, ‘Twist and Shout’ (the latter two sung by John) especially, along with ‘A Taste of Honey’ taken by Paul. The other two are OK but fillers in my mind. It’s the Lennon and McCartney numbers which make the album though – fresh, rawly energetic and confident with the talent shining through. The outstanding numbers are the upbeat rockers ‘Please Please Me’, closing side one and ‘I Saw Her Standing There’ which opens it. These are timeless classic pop. ‘Love Me Do’ with it’s harmonica riff is also up there with the best, along with my personal favourite, ‘There’s a Place’ – with its dual vocal and, once again, harmonica. I guess it’s getting harder to get across nowadays the place the Beatles occupied in popular culture in the 1960s in Britain – and perhaps I over-exaggerate it in my mind because by the time I hit adolescence, they’d gone their separate ways, leaving a hole no-one has filled since. But even so, these are the guys who broke the mould of what could be expected from young English musicians. This album was the second long playing record that I bought with my own cash (as opposed to receiving as a gift) and, frankly, it was a pretty good choice: popular enough be safe, edgy enough for a bit of credibility when loaning out to friends! John Lennon was always my favourite Beatle (and yes, I am old enough to remember the Beatles – at least since my sister took me to see Hard Day’s Night at the Granada cinema in Greenford, west London, when it came out!) 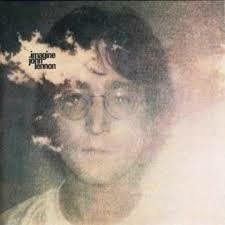 and ‘Imagine’, which came out on Apple in 1971, is a great and commercial album (the earlier Plastic Ono Band may even be better but certainly less accessible and I have yet to meet anyone who owns the earlier ‘experimental’ albums Two Virgins and Life With the Lions). There are ten tracks and all are cracking. Of course the the utopian idealism of the title track made a big impression on the 13 year-old me – but so too did the simplicity and percussive piano. The next track ‘Crippled Inside’ also has a strong honky-tonk piano line. ‘Jealous Guy’, the next one, is confessional and honest (unlike the cringe-worthy cover Bryan Ferry did) as is ‘Oh My Love’ and ‘How?’ – really simple and direct, probably a result of Lennon’s experiments with primal scream therapy. ‘Gimme Some Truth’ is a protest song with the great line “No short-haired, yellow-bellied, son of tricky dicky’s gonna mother-hubbard soft-soap me with just a pocketful of soap. It’s money for dope Money for rope”. Not really that surprising that the US authorities were a bit wary when John went to live in New York. Then there’s ‘How Do You Sleep?’, believed by many to lash out at Paul McCartney (something amplified by a postcard picture of Lennon with a pig included in my original record but since lost) which was seen as a sarcastic riposte to Macca’s manhandling of a sheep on the cover of his ‘Ram’ album). The presence of George Harrison on guitar was interpreted at the time as equally significant! The final track, ‘Oh Yoko’ is beautiful: John’s heartfelt, upbeat song of joy to his soulmate. This is one LP I’ve not bought as a CD because, in my head, it will forever remain in 1971!